On the surface of things, Smashed Potatoes and Decadent Hot Chocolate don’t seem to have much in common. But if you delve a little deeper, you’ll find the connection. Both mashed potatoes and hot chocolate can be made via the instant, just-add-water type. Which isn’t bad if, say, you’re camping. They can both be quite tasty, depending. treat, it all starts, of course, with the potato itself. I use fresh, hard, baby yellow potatoes, or baby reds if I’m in that mood. They both work. Slightly bigger than the baby potatoes work as well; you just need to cut them a bit smaller. I’ve never used russets or baking potatoes for this; I assume if you peel them and chop them into similar-sized chunks, they’d work fine. Kitchen ware needed: One sauce pan, one baking pan with sides (either a jelly roll pan or a 9 x 13 pan), and one slightly smaller pan of the same type (or a cast iron skillet). Heat the oven to 425 degrees. Scrub the potatoes well. If they are true babies, cut them in half. If they’re a little bigger, cut them in quarters. Your goal is to get them all about the same size so they cook evenly. Put them in the saucepan, fill with water, and boil until they are fork-tender about 10 – 15 minutes. Drain. Put potatoes, still steaming, into the jelly roll pan. Crowd them together in the center of the pan, as much as possible, so they’re all touching. Take your slightly smaller pan (or your cast iron pan – anything heavy that you can put your hands into) and make sure the bottom of the pan is clean – you might even want to lightly spray it with cooking spray. Set the second pan on top of the first pan (I put the pan with the potatoes on the floor) and, with all your weight, press down on the second pan so it “smashes” the potatoes to about half to 3/4 of an inch thick. Spread butter on top of the potatoes; sprinkle with sea salt or Kosher salt. Put in oven for 20-25 minutes. If your potatoes are done before the rest of the meal is done, just turn off the oven and keep the door closed. The potatoes will crisp more while you finish up. Is this calorie-free? No. More butter makes it taste better. But it’s a fabulous side dish that you can wow your friends with. To make it fancier, sprinkle some freshly chopped parsley on top. Serve directly from the oven to your guest’s plates. They will thank you for it. thanks to dancingbranflakes.blogspot.com for the photo! Perfect for the Holidays, or any day where it’s chilly outside, the powdered stuff will get you by. It’ll do in a pinch. But when you want to see how it feels to be Royalty, have your kitchen slave whip you up some of this bundle of delicious goodness, and you’ll feel your holiday stress melt away. Ingredients: 1 cup high quality 60% cacao chocolate (I use Ghiradelli – but regular choc chips are fine) 4 cups milk, 3 Tlb powdered baking cocoa, 3 Tlb white sugar, 1 cup heavy whipping cream. Put chocolate in a pan, and add just enough milk from your 4 cups to float the chips a bit. Heat until chocolate is melted through, stirring the entire time. Once melted, add the rest of the milk a little at a time, keeping the heat on medium (don’t boil!). Then add the powdered cocoa, one Tlb at a time, whisking it in. Do the same with the white sugar. Once that is incorporated, slowly add the 1 cup heavy whipping cream, stirring the entire time. Continue to stir until the chocolate is hot again. Then drink and be glad you are human! 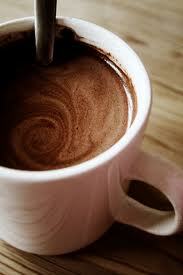 This goes beyond mere hot chocolate. This will put you into Holiday Nirvana. Turn the Christmas lights on, put the carols on, and get the wrapping paper out – no chore is too much to handle when you’ve got a cup of Decadent Hot Chocolate by your side! Coming up: This Friday, I talk about affordable wines. More reds – three really good ones, and a chameleon wine…see you then! Demon Soul is available for the Kindle and the Nook, as well as in paperback! It makes a great Christmas present, lol! This entry was posted in Cooking and tagged blog, butter, Christine Ashworth, cooking, cream, Decadent Hot Chocolate, demons, fancy side dish, Holiday, Nirvana, Paris, potatoes, smashed. Bookmark the permalink. I’m big on mashed potatoes but I love hot chocolate. Thanks for the recipes. You’re so welcome, Janie! Cheers dear, and sorry I missed your talk at LARA on Sunday. I wish we lived in the same part of the country, so you could hang out with me and my foodie friends and drink red wine. Only then I’d be gaining even more weight! Ah but Teresa, if we lived near each other, before indulging we’d shame each other to the gym. It could so work out! Cheers hon! Hi Christine! The recipes sound wonderful, have them book marked for later! Thanks for sharing! Hey Deanna! Thanks for dropping by – glad to see you here! Now that’s a way I’ve never heard of for making potatoes. Sounds yummy. Must try it. Oooh, these both look good. Especially the hot chocolate. I’m big on doing things the hard way just to see how they turn out. OGM Catie! 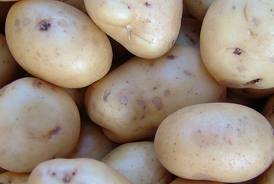 I am SO making these potatoes! I think I’d toss in thyme and some chopped garlic…but the dill sounds good, too. Thanks for stopping by! Both those recipes sound yummy – thanks for sharing! Read this on my phone when you posted it, just can’t comment from there for some reason. OMG! Yummy, yummy, yummy! You know the way to my heart. 🙂 Love potatos! Chocolate makes major points with my kids! There isn’t a more perfect time to give this a try than this next week when I’m not crazy bogged down with school homework schedules. Yay!